I have come to realize that what makes a story great is purely subjective. Though it tends to hold true that every story requires some basic elements (interesting plot, relatable characters, climax, and ultimate resolution) to be considered a story of quality, compounding all of these elements into a single story is not necessarily required to make for an excellent narrative. 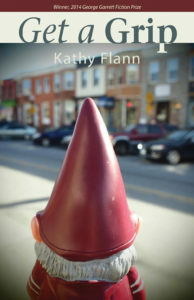 Kathy Flann’s Get a Grip is a collection of short stories featuring tales with a strong sense of place (for Flann, Baltimore, Maryland) and believable characters in the midst of struggles with identity, relationships and often devastating circumstances. Flann interestingly opens her collection with a second person narrative titled “Neuropathy,” told from the point of view of a recent widow trying to cope with her husband’s sudden death, as well as her souring relationship with her 21-year-old son, Peyton. The story centers on their often claustrophobic life in a neighborhood where many struggle with drug addiction and poverty. Following a narrative style with religious overtones, Flann captures the mother’s controversial ideologies, ultimately putting a face to them. The reader goes on to experience the give and take of this dysfunctional relationship in many forms. The curious circumstances surrounding the husband’s death are eventually revealed, which led to the eccentricities of the protagonist, who more often than not reads and feels much more like an antagonist. The truth was that we didn’t know what we were. Our Estonian mother, blond and blue-eyed and six feet tall herself, wouldn’t tell us. The recurring theme of outsiders in society, and the complications that result, here indicates a pattern common to each of Flann’s narratives: the wide range of characters are made real and believable through their personal flaws and external struggles. The common setting of Baltimore further provides the reader with a sense of what it’s like to be a member of all different walks of life in Maryland, in particular those who feel out of place and otherwise disconnected from society. Whether these feelings are due to personal beliefs or harmful relationships, this feeling of alienation serves to bring the reader in and exist with Flann’s characters in a tangible, empathetic space. Fiona and Jeremy had been arguing for two days about whether or not it was dangerous for him to ride bikes with his friend Zack at the construction site down the street, zooming ten feet into the air from a concrete pipe. But even before that, it was hard for Fiona to remember their last good-natured or even neutral conversation. This story, as with each in the collection, is characterized by outer conflict and inner turmoil. The title, then, is exceedingly appropriate, as the phrase “Get a grip” is often said to someone during an argument. In many of Flann’s narratives, the tension stems from sibling, relational, or other arguments between relatives and close friends. Although the plot points guiding these stories are familiar, Flann’s true skill involves holding up a microscope to our everyday lives and relationships, to show just how much substance can be gleaned from such aspects of mundanity. There are certainly moments of humor and vulgarity to be found and cherished as comic relief throughout Get a Grip, but the final installment, ironically titled “Heaven’s Door,” is perhaps the most outrageous. Following a passionate TV meteorite hunter/enthusiast, we embark on a journey for treasure from outer space and experience the tangled relationships of a micro culture of space-enthusiasts and eccentrics along the way. By the end, it seems as though we have come full-circle, particularly with regards to the religious undercurrents in each story as well as feelings of inherent loneliness and failure to belong. It is important to note, however, that Flann never fails to instill within these complex and admittedly dark themes more than a dash of humor and lightheartedness, along with such memorable characters. Reaching the end of the collection, I felt a sort of disappointment creeping in at the edge of my psyche: not with the stories themselves, but with the notion that the reading was finished, which meant that I would cease interacting with such cleverly imagined characters in their native Baltimore. Gabriella Shriner is an undergraduate at Fairleigh Dickinson University and editorial intern at The Literary Review. She lives, writes, and knits in Northwestern New Jersey.